The issue's feature article is a comprehensive discussion by Dr. Seddon R. Savage and colleagues on the challenges of using opioids to treat pain in patients with substance use disorders. Addressing an audience of addiction specialists, the authors describe the nature and physiological basis of pain, explore its interrelationships with substance use, present methodical approaches to the evaluation and treatment of pain and co-occurring substance use disorder, and discuss the clinical and ethical challenges that both pain management specialists and addiction professionals face when treating this population. Drs. Linda A. Dimeff and Marsha M. Linehan describe Dialectical Behavior Therapy (DBT), a treatment originally developed for suicidal patients with severe psychosocial disorders. The authors discuss their modification of DBT for treating substance abusers, DBT's strategies for promoting abstinence and preventing relapse, and the clinical trials that demonstrate the therapy's efficacy. Finally, Dr. Kyle Kampman discusses current research efforts toward developing effective medications for stimulant dependence. In this issue, Dr. Alan J. Budney and colleagues review recent research on marijuana dependence, withdrawal, and treatment. Dr. Sharon Samet and colleagues discuss several formal assessment instruments used to diagnose psychiatric disorders and their utility in diagnosing abuse and addiction. Dr. Diana Sylvestre explains the disease process, screening methods, and treatment of hepatitis C in the context of addiction medicine. Finally, Drs. Michael Dennis and Christy Scott explore the discrepancy between acute-care models of addiction treatment and the compelling evidence that addiction is a chronic condition. In this issue, Dr. Joanna Fowler and colleagues offer a detailed overview of the imaging techniques that enable researchers to observe drug actions and consequences as they occur and persist in the brains of abusing and addicted individuals. The article is followed by an in depth discussion between a clinician and researcher on the practical implications of imaging data on the day-to-day treatment of drug abuse. The issue also features a Research Review addressing the necessary steps a treatment program must take in order to effectively implement organizational change. 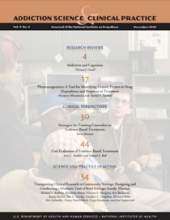 The issue's first Clinical Perspective describes the implementation of Treatment Improvement Protocol 33, “Treatment for Stimulant Use Disorders,” in an Iowa treatment program and the second offers advice on how providers can improve the quality of their substance abuse care and respond to the growing emphasis on research-based interventions and performance measurement. Also featured is a review of innovative methods for treating emotional cues for drug abuse that make use of exposure therapy to help patients recognize and withstand the powerful cues they face outside of the treatment environment. In this issue, the journal offers Research Reviews on the neurobiology of cocaine addiction and on the common co-occurrence of mood disorders and substance abuse disorders. 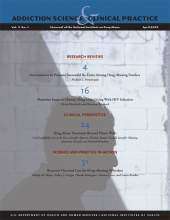 The issue's Clinical Perspectives present a veteran clinician's reflections on the 30-year history of methadone and the status and challenges facing this treatment today and a description of the broad array of agencies, institutions, and individuals that act as stakeholders in drug abuse treatment and how they interact with community-based treatment programs. Also featured is a multi-voiced narrative of a research-practice collaboration between researchers at RAND Corporation and the community treatment providers at Behavioral Health Services in Los Angeles. NIDA's peer-reviewed journal for drug abuse researchers and treatment providers highlights ways in which dialogue between scientific investigators and clinical practitioners is improving drug abuse treatment and research. The Director's Column in this issue calls attention to several NIDA initiatives to create links between the production of scientific knowledge and its application. The lead section focuses on buprenorphine, an FDA-approved medication for opioid addiction. Details are provided on how it works, its efficacy and safety profile, how it is used in withdrawal and maintenance treatment, and how patients should be selected, educated, and monitored during treatment. Other topics include a description of how Behavioral Couples Therapy is being used in the treatment of substance abuse; a description of a pioneer residential treatment program for parents and their children; and a report of a panel discussion featuring prevention researchers and representatives of community drug prevention coalitions. In this issue, the journal offers Research Reviews on integrating substance abuse treatment with ongoing criminal justice supervision and providing concurrent treatment services to adolescents with substance abuse and comorbid psychiatric disorders. Clinical Perspectives include targeting nicotine addiction in a substance abuse program and the role of 12-step treatment in recovery. The issue also features a researcher-provider exchange on low-cost incentives. 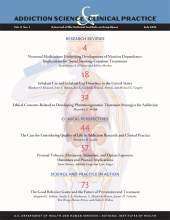 In this inaugural issue, the journal offers perspectives in HIV/hepatitis prevention in drug abuse treatment programs, how the neurobiology of opioid dependence influences treatment, issues in improving opioid treatment outcomes, action therapy and trauma assessment in women's treatment, and behavioral reinforcement to improve methadone treatment participation.